Enjoy live Music, shopping, dining, and dancing on fabulous 5th Avenue South! Evening on 5th will feature an array of live musical performances throughout the sidewalk areas of 5th Avenue South. You can also enjoy fabulous dining, and the opportunity to explore the distinct boutiques, shops, and galleries that span from 9th Street to 3rd Street. Relax with friends at dinner or dessert, or dance the night away! Contact Fifth Avenue South Business Improvement District at 239.692.8436 for more information. This classic musical is the Cinderella story of Eliza Doolittle, a cockney flower girl who grows into a refined lady with the help of the haughty speech therapist, Henry Higgins. As Eliza blooms, so does their romance, but coming from two different worlds proves to be challenging. My Fair Lady boasts a memorable score with songs like “I Could Have Danced All Night,” “I’ve Grown Accustomed to Her Face,” and “On the Street Where You Live.” Tickets may also be purchased in person at the box office, Monday through Friday 10 AM to 4 PM and Saturday 10AM to 1 PM and two hours before the performance. For more information visit naplesplayers.com or call the box office at 239-263-7990. A thriving art and crafts community, and the Naples Artcrafters sponsor a juried Fine Art and Craft Show every month from October through April. Established in 1967, this non-profit organization is committed to promoting excellence in arts and crafts and to supporting established artists, crafts persons and students. Come on out to check out paintings (oils, acrylics, water colors), drawings (pen and ink, pencil), pastels, scissors art, multi-media and collage, photography, ceramics, jewelry, sculptures, clay work, and stained or fused glass work. It’s all there in a beautiful setting. Go to naplesartcrafters.com for more information. The 30th Downtown Naples Festival of the Arts takes place on Saturday, March 18th and Sunday, March 19th and allows thousands of art-savvy festival goers to mill about the 230+ booths that participating artists set up under the canopy of oak boughs and golden trumpet trees that shade flower-lined Fifth Avenue South from southwest Florida’s brilliant springtime sunshine from Highway 41 west to 3rd Street South just blocks from the gulf, nestled between rows of Mediterranean-accented buildings that are home to European-style boutiques, high-end jewelry stores, prestigious art galleries and some of the finest restaurants, bistros and outdoor cafes in all of southwest Florida. Shoppers will have the opportunity to mingle with professional artists from around the country in categories ranging from original oils and acrylics on canvas to watercolors, 2D and 3D mixed media, limited edition prints, photography, digital art, sculpture, wood carvings, ceramics, hand-crafted jewelry, leather works and more.There is free parking in and around 5th Ave S. or you can ride your bike! Admission is free but donations are always greatly appreciated and benefit The Naples Art Association art education programs. Visit naplesart.org for more information of call 239-262-6517. The Naples Big Band brings big band music to the Naples area with a 19-piece big band that plays concerts and dances from October through April. The band’s repertoire includes more than 1,000 arrangements made famous by people like the Dorsey Brothers, Duke Ellington, Count Basie, Les Elgart, Glenn Miller, and current artists. You’re sure to hear some of your favorites! The band also provides student scholarships and financial support to Collier County high schools’ band programs. All donations and any contributions are appreciated in order to support music for all ages. Join us at the Cambier Park Bandshell! Visit NaplesBigBand.com for more information or call 239.348.3675. If you love this music that has its roots in New Orleans (but comes from many American sources) you won’t want to miss this even. You can also enjoy minstrel shows, ragtime, cakewalks, and the blues. There’s nothing happier than a toe-tapping Dixieland tune—and nothing sadder than a sorrowful blues tune. This is true American culture at its best! Join us at Cambier Park, or call 239-263-1113 for more information. You can participate in any or all of these great events. 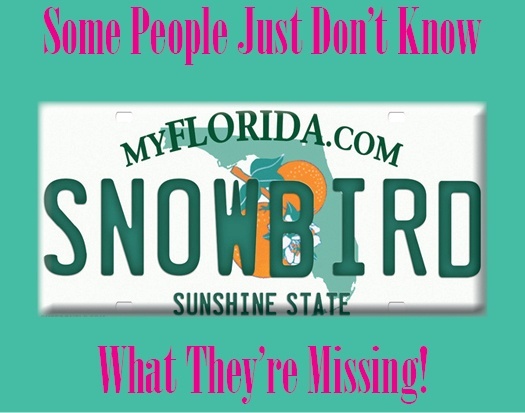 And it’s OK if you feel a little sorry for the snowbirds that left early and don’t have a clue what they’re missing!